Seattle Opera's Young Artists Program has only two performances of Don Giovanni remaining--this Thursday and Saturday--so it's about time for us to chat with Giovanni himself, a.k.a. baritone David Krohn. Although Krohn has performed in other productions of this Mozart opera, this is his first time taking on the famous lead role. We asked Krohn how he feels about his character, how this YAP production stacks up against his other Don Giovanni experiences, and--because this is Seattle, after all--if he sees any Wagner is his future. Tell us about any other productions of Don Giovanni you’ve done. Which role(s) did you play? Were the productions similar or different to this one? This is my third production of Don Giovanni. My first experience with the opera was understudying the role of Masetto with the New Jersey Summer Opera Theatre, when I was 19 years old. It was a wonderful chance to get to know the opera in a low-stress setting. The opera was fully staged, but performed with piano in a small space, so there was little pressure for me as a young singer. It wasn't until this past year that I revisited the opera, when my good friend Joe Walsh, who was conducting the piece with Virginia Opera, lost his Masetto two weeks before rehearsals started. It had been a long time since New Jersey, but I was able to learn Masetto and also to understudy the title role, which, by then, I knew I would be singing here in Seattle with the Young Artists Program. We did a total of nine performances in three cities with a fantastic cast, led by director Lilian Groag. Virginia Opera has a reputation for a VERY long rehearsal period and Lilian was a tireless director, rehearsing scenes in incredible detail to help paint her vision with a fine paintbrush. Because of this, I was able to learn Don Giovanni and get a deep insight into the challenges I would face with the title role in the following season, while I performed Masetto in Virginia. 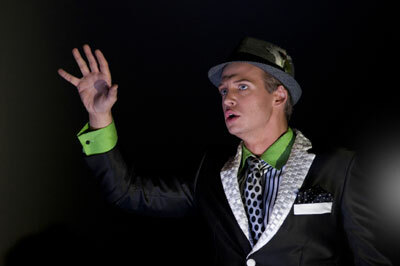 David Krohn in Seattle Opera's Young Artists Program's production of Don Giovanni. It's tough to compare either of the ones I've done since to the production in New Jersey, since it was the inaugural season of the company and there were minimal sets and no orchestra (I understand that in recent years the festival has upgraded to performing with orchestra in a much larger theater). But with the production in Virginia, Lilian's concept for Giovanni was much more literal than Peter Kazaras’ concept in this Young Artists production. There we used period costumes and made many traditional staging choices. Here in Seattle, Peter has taken great pains to create a different world and physical vocabulary for the characters, separating them from any other production of Giovanni I've ever seen or heard of. While this may bother some of the purists in the audience, I have great respect for what Peter has tried to do here. With the climate of opera changing so much, it is sometimes necessary to take risks to present something fresh and relevant to an audience. Besides that, it's truly impossible to compare my experience in Virginia with Seattle. As a member of the Young Artists Program, I've been able to work closely with our conductor, Maestro Brian Garman, for the past six months leading up to this production, for Donizetti's Viva La Mamma!, our Siegfried outreach project, and the Schubert lieder recital we gave, along with countless coachings and auditions with varied repertoire. It is a huge advantage to have a conductor in the pit who fully understands your voice, and to understand your conductor's musical aesthetics. While on stage, there are times that I catch his expression out of the corner of my eye and know immediately what he is asking me to do, which is something that can only come with time and repetitive work together. 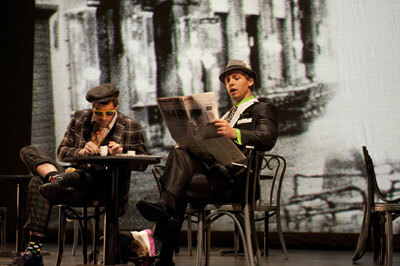 Erik Anstine (Leporello) and David Krohn (Don Giovanni) in Don Giovanni. In addition to being a singer, we understand you’re quite an outdoorsman. What do climbing mountains and singing operas have in common? Well, for one, Don Giovanni is a long role and requires a lot of stamina. While it is always crucial to pace yourself in getting through the evening, it is sometimes equally important to simply put one foot in front of the other and stay focused on the terrain around you. On my drive to Seattle, I climbed Mount Whitney in California with a buddy I had just finished singing a Barber of Seville with in Aspen. The climb took over 15 hours. We started at 2 a.m. with headlamps and made it to the summit right before noon and back to the trailhead at sunset. Focus is always important on a long day of hiking and climbing, because as soon as your concentration begins to wane, the consequences can be staggering. While the dangers of a screwing up on a mountain climb are much scarier than those of screwing up on stage, neither is fun. The feeling of accomplishment after a successful performance is unbelievable. You come home after a long night of performing and should be exhausted, but for some reason, you can't sleep. Same with mountaineering. Don Giovanni is a hero to some, a villain to others. What do you find attractive, and repellent, about this character? Absolutely, Giovanni is a hero and a villain wrapped into one. For me, the greatest thing about Giovanni (and perhaps the most frustrating) is that he doesn't change one bit from the start of the opera to the end. He comes on stage after having tried to seduce a woman and he does the same thing in the final scene with Elvira. Even when he is faced with his own demise, he looks death in the eye and refuses to change. He has his moral code—and while nobody can honestly consider his view on life acceptable, you have to admire someone who believes so strongly in himself. It's like the man has no doubts whatsoever. AND, he's clever. It takes a supernatural occurrence to finally do him in. Masetto, Donna Anna, Don Ottavio, Donna Elvira, and Zerlina combined can't stop him. No one can. It's almost like he's not even human, but an archetype. Of course, you have to find moments on stage to make him human, or else there is no way an actor can portray him successfully. 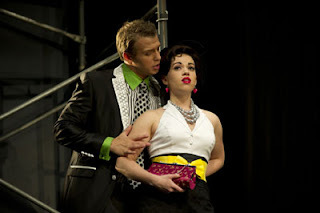 David Krohn (Don Giovanni) and Amanda Opuszynski (Donna Elvira) in Don Giovanni. You first came to Seattle as a Wagner fan, and recently got to sing some Wagner for this company. What was that like? Perhaps Mozart is better-suited to your voice right now…but should we expect to hear you singing Wagner again someday? 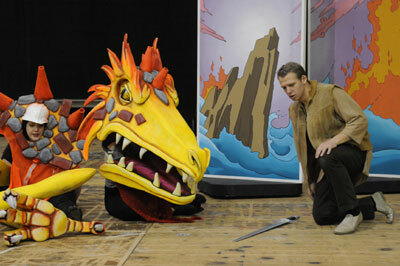 You're right, I was involved with the Young Artists Program's outreach production of Siegfried and the Ring of Fire. But it can't precisely be called “singing Wagner.” The roles were transposed, sung in English, shortened to less than a tenth of their actual length and separated by dialogue and performed with piano. There are no principal roles in Wagner's canon that I feel ready to take on just yet. Sure, plenty of famous lyric baritones have taken on Wagner early in their careers—Dieskau and Hampson, for example, sang Amfortas and Wolfram regularly—but I would rather take these critical years in my career to enjoy Wagner from the audience. It's tough to say what my voice will do in the coming years, but I can say this: If I do work my way into Wagnerian repertoire, there would be no more exciting place to sing these operas than here in Seattle. Siegfried (David Krohn) converses with the dying Fafner (sung by Marcy Stonikas, among others) in Siegfried and the Ring of Fire. As a lyric baritone, you belong to a group of singers who must both look nice and sound good. When you’re in the audience at an opera, do you find yourself judging singers in terms of voice, appearance, or both? When I'm in the audience, I always consider the voice first, before anything. Don't get me wrong—singers need to be able to look good and act well on stage. You're selling a whole package of looks and a good voice. But there's so much more than that, too: dancing skills, acting skills, professional behavior, collegiality, preparedness, language skills, musicianship, and the list goes on forever. Modern productions are putting more and more demands on singers, asking them to do things that the Golden Age singers would never have put up with. Could you imagine someone asking Maria Callas to stage an avant-garde production of Tosca, making her ride a bicycle during "Vissi d'arte" or something like that? Directors are requiring that kind of flexibility from singers and the reality is that if singers want to have a career in this changing world, they have to be able to adapt. I'm not saying there is no validity in the avant-garde, but we have to remember that the music comes before anything. But if lyric baritones are asked to have their shirts off more and more, I'll keep hitting the gym to meet the demand. How articulate this young man is! What a talent - the whole package - I saw his opening night and was amazed at his consistent performance - both wuth portrayal of the character and his wonderful voice.